CHARLOTTE, N.C. — Thousands were without power across the Carolinas Friday evening after severe weather slammed the region. Tornado warnings were issued in Alexander, Iredell, Catawba, Lincoln counties in North Carolina and Chester, Union and York counties in South Carolina on Friday afternoon. Storm damage, including downed trees and power lines, was reported in many areas including northwest Charlotte, Bessemer City, and Lincolnton as well as York, Alexander, and Lancaster counties. As of 11 p.m. Friday, Duke Energy reported 36,000 customers without power across the Carolinas, with 4,000 of those customers in Lancaster County. Many areas were hit with heavy rain and flash flooding. A tornado watch that was originally set to expire at 5 p.m. was extended to 8 p.m. as meteorologists watched another line of storms move toward the metro. 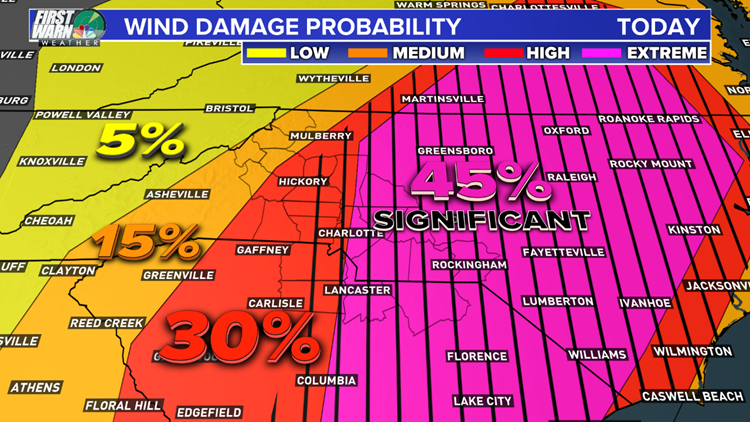 Earlier in the day, the National Weather Service put areas east of Charlotte in the extreme category for probable wind damage, something that's rarely seen in the Carolinas. Heavy rain was spotted in Burke County along I-40 by 1 p.m.
As Charlotteans know, trees in the Myers Park area fall during any storm, so gusty winds above 35 mph are problematic and can lead to damage and widespread power outages. "When you get winds over 55 mph that can cause a lot of major problems," First Warn forecaster Larry Sprinkle said. The probability of wind damage in the Chalrotte area is significant Friday, especially in areas east of the city. STAY WEATHER AWARE: Download the NBC Charlotte mobile app for the latest severe weather alerts and warnings. 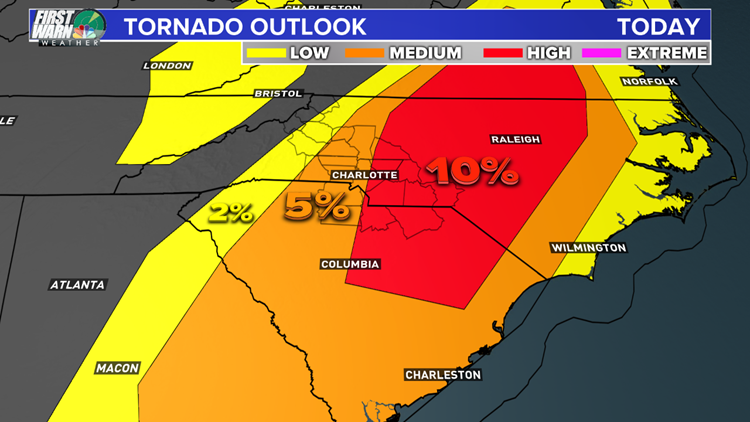 The Carolinas will be at risk for tornadoes during Friday's storms, including an elevated threat east of Charlotte. Sprinkle said some areas south and east of Charlotte could see up to 2 inches of rain, while nearly every area will receive at least a half-inch from the storms. The storms moved out of the Charlotte area Friday night. Saturday will be cooler in the 60s while Easter Sunday will be a beautiful sunny day with afternoon highs in the mid-70s.